A few gusty days earlier this week left many trees bare, and rain is predicted daily for the foreseeable future. I realized that if I wanted to sketch any more color, I’d better get on it ASAP. I was willing to go farther, but I found this street only a couple of blocks from home. The sun broke through sporadically and just long enough to give me a few shadows. By the time I got home, the rain had already begun. P.S. It’s the last day of October, and you know what that means: InkTober is over! Are you as relieved as I am? 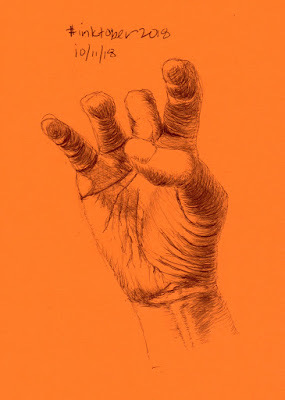 And yet, I’m surprised by how much I’ve grown to like ballpoint. Stay tuned tomorrow for my final InkTober review. Morning fog has become such a regular occurrence that air quality has begun to suffer. It’s not a good thing for people who experience respiratory issues, but since I don’t, I enjoy it. 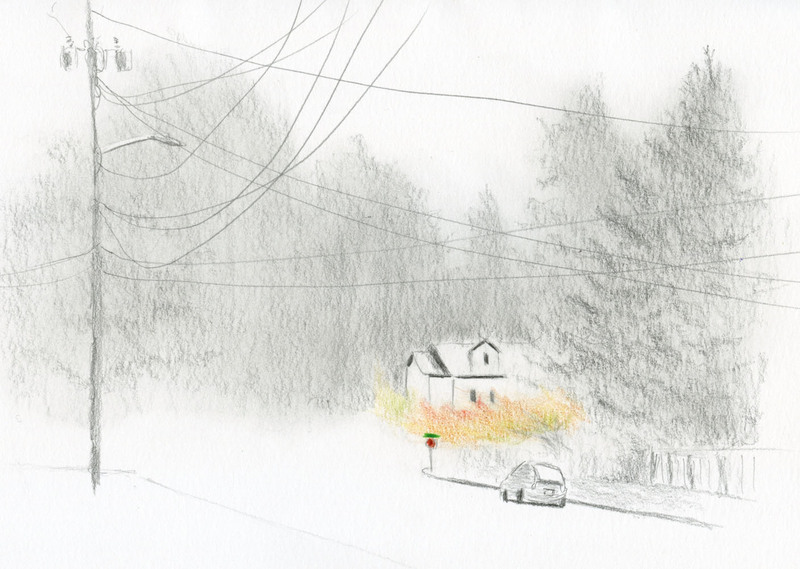 Like snow, fog seems to insulate the world, softening sounds and casting a sense of mystery. On Saturday I was in the Magnolia neighborhood’s public library for a meeting. Just outside, fog hung heavily over the fir trees, but a decorative cherry leaning over a fence gave the view a spot of color. 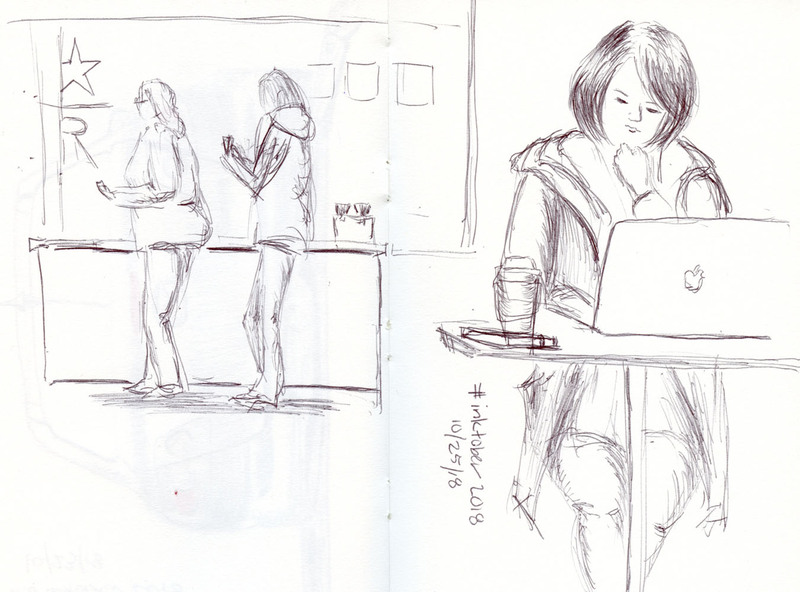 At Starbucks the other day, I sketched a young woman working at her laptop. She was young, but she wasn’t eight, as she might look in my sketch. 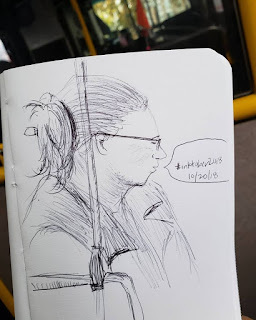 When I compared each feature I had drawn to her face, I thought I was reasonably accurate, and yet a small miscalculation in facial proportions or some other subtlety can result in a 30-year-old woman looking like a child. Ah, if only we could shave a few years or decades off our own appearance so easily! Of course, I’ve done it the other way, too: Made attractive young men look like old geezers, even when I kept their hairlines intact. 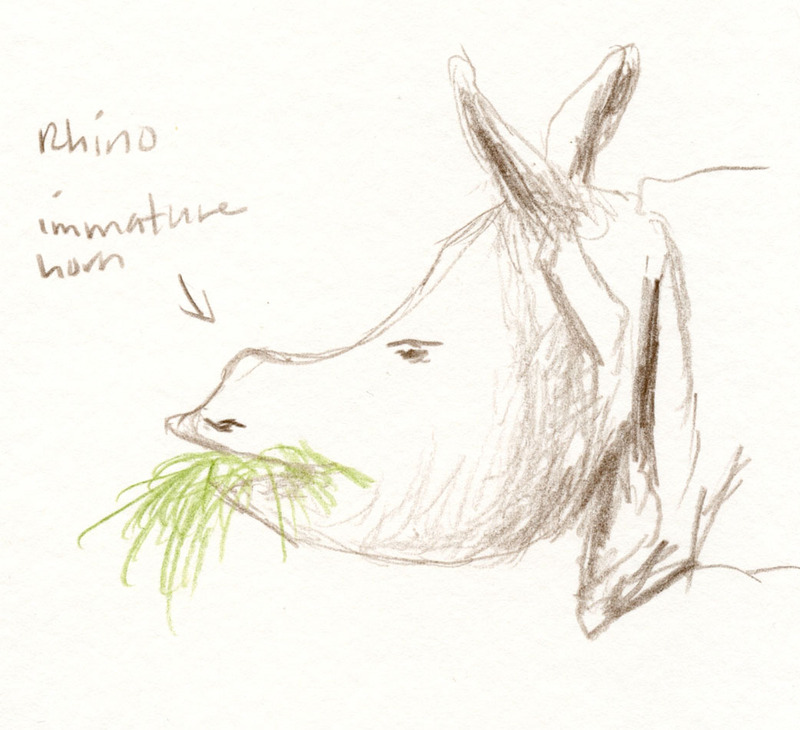 The sketchbook can be cruel or kind (and usually arbitrary). Although we’re still seeing plenty of trees with brilliant color, many have already lost their leaves. 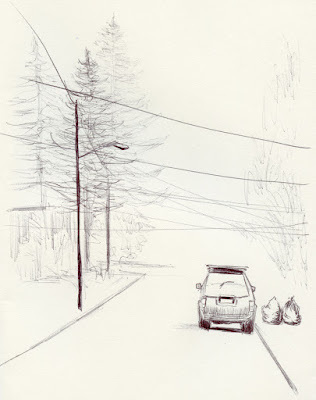 A few blocks from home, this street surprised me – the row of trees went bare, seemingly overnight. 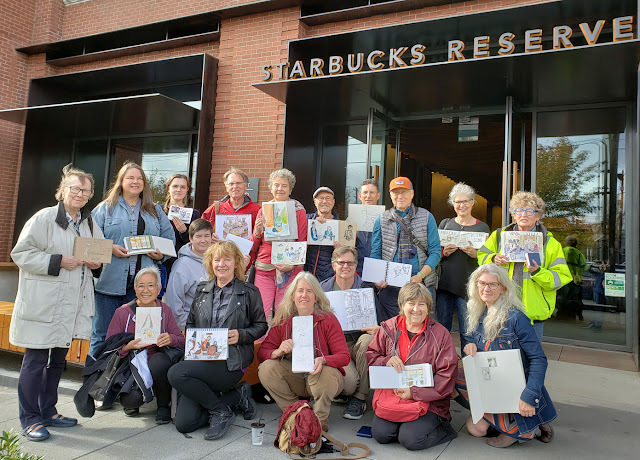 Although our outings are always fun and exciting in an urban sketching sort of way, none of us expected the kind of excitement we had yesterday at the Starbucks Reserve SoDo store and café. I had arrived a few minutes early, so I was still in my car when hundreds of people suddenly started pouring out of the buildings and onto the parking lot. I was afraid we had chosen to sketch there on the same day as a major convention! I soon learned that a fire drill was taking place at Starbucks headquarters. 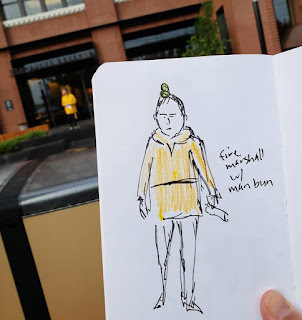 Waiting outside in the wind and rain, a few other sketchers and I watched as the fire marshal attempted to keep people from entering, sometimes ineffectively. We decided that his bright green man bun added nothing to his authority. 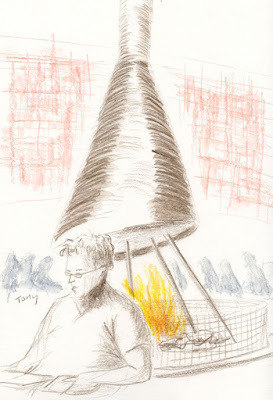 Eventually we were allowed to enter, and I was grateful that the only fire was the one burning in the cozy fireplace in the center of the store. 10/26/18 Tony sketching by the cozy fireplace. The first time I sketched at the SoDo Reserve last March shortly after it had opened, a bright red slicing machine had caught my eye, but I couldn’t find a clear view of it then. This time I shared a table with Kathleen, which gave me reasonably good view (except for the continual stream of customers at the counter that I had to dodge). 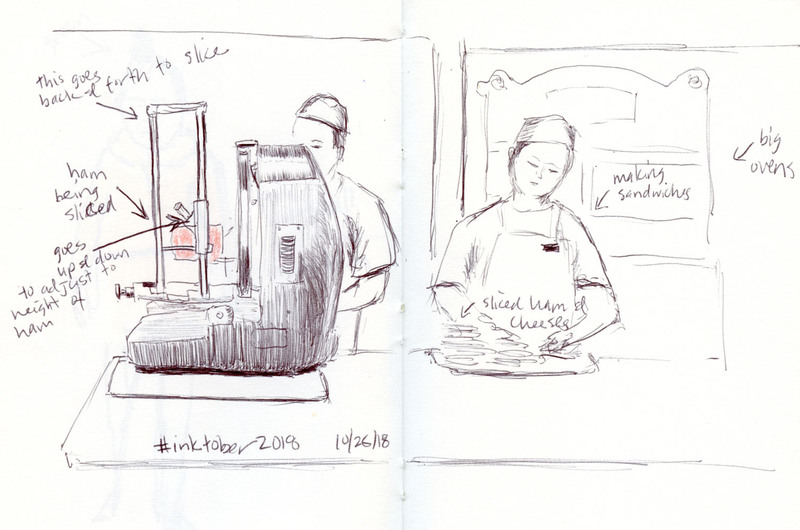 My intention was to simply make a ballpoint InkTober sketch of the retro-looking machine, but I ended up being fascinated by its mechanical workings as a deli worker sliced ham for the sandwiches she was making. 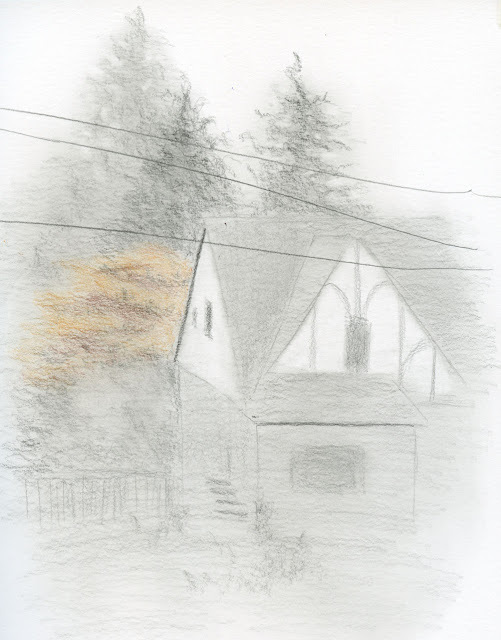 The fog was so thick Tuesday morning that I could barely see the house across the street. I went upstairs to sketch this from our bedroom window. The utility wires dripped as if with rain. Even through the pea soup, I could see the warm glow of our neighbor’s tree. It’s one of my favorite things about fall – seeing trees blazing through fog. Technical note: I’ve lately been experimenting with putting a bit of color in my mostly-graphite sketches (I tried it in the sketch I posted yesterday, too). If I try to apply colored pencil over graphite, it doesn’t layer well, so I erase out a clear spot of paper first. 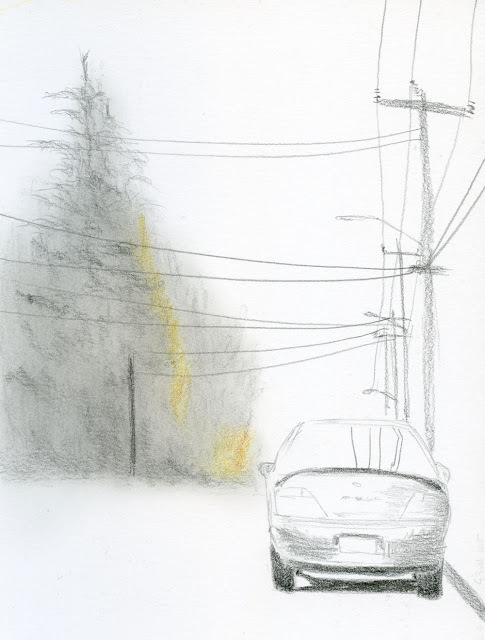 Then if I want to mute the hue further as I did in this foggy scene, I can smudge graphite over it. What do you think? Is the touch of color effective? As is typical for this time of year, fog has been rolling in at night and staying through the morning, shrouding the Puget Sound area with a thick white blanket. 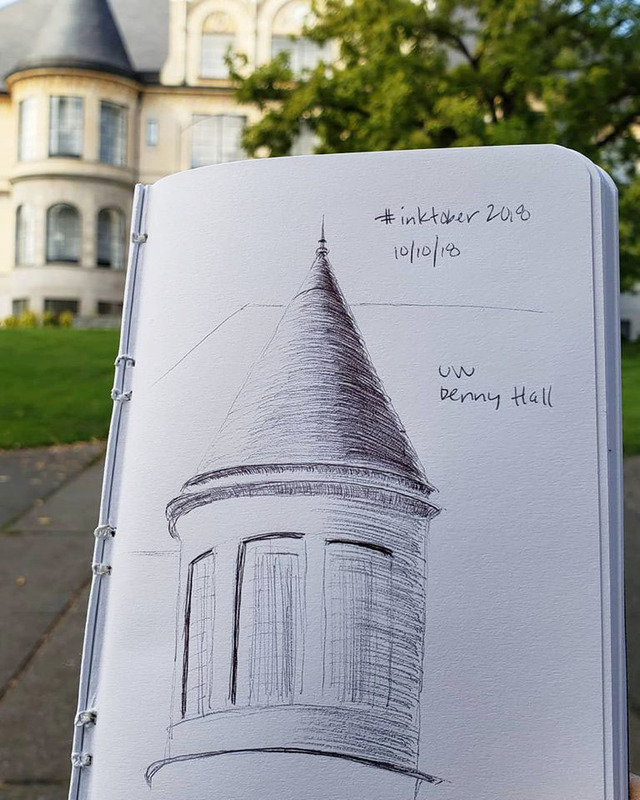 It burns off by early afternoon, so I usually wait until the sun breaks through to go out sketching. On Monday morning, though, the fog was exceptionally dense and mysterious, and I couldn’t resist heading out to the Wedgwood neighborhood, where I knew the fog would be thickest. When sketching fog, my first impulse is to reach for graphite, but since my Bic ballpoint is adhered to my left hand for InkTober, I thought I’d give it a try. Although it’s been helpful to learn to use a Bic by thinking of it as a pencil, the one thing I can’t do with a ballpoint is lay it at an angle and smudge the ink into a soft haze. I may be getting friendlier with ballpoint, but that doesn’t mean I don’t miss graphite. 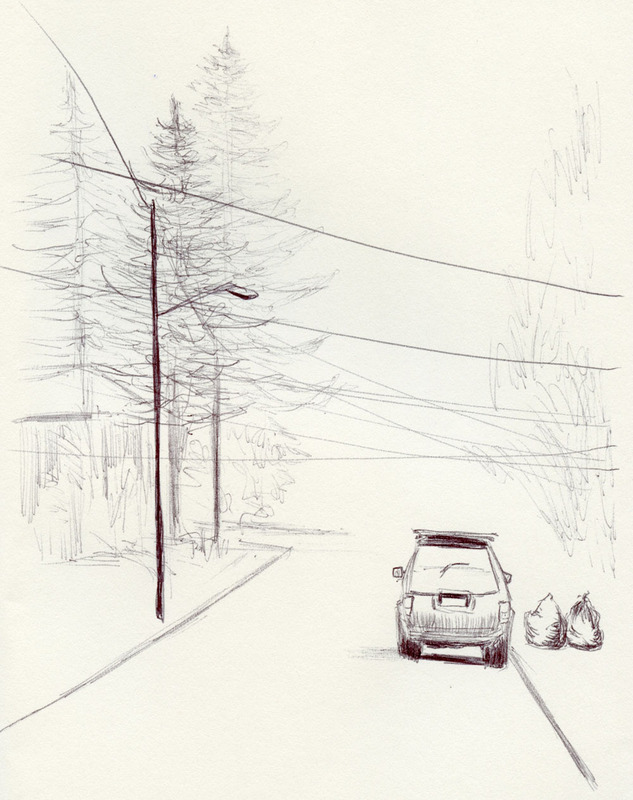 After sketching the street at left with the Bic, I couldn’t resist one more – this time with graphite. You can take the pencil away from the girl, but you can’t take the girl away from the pencil. 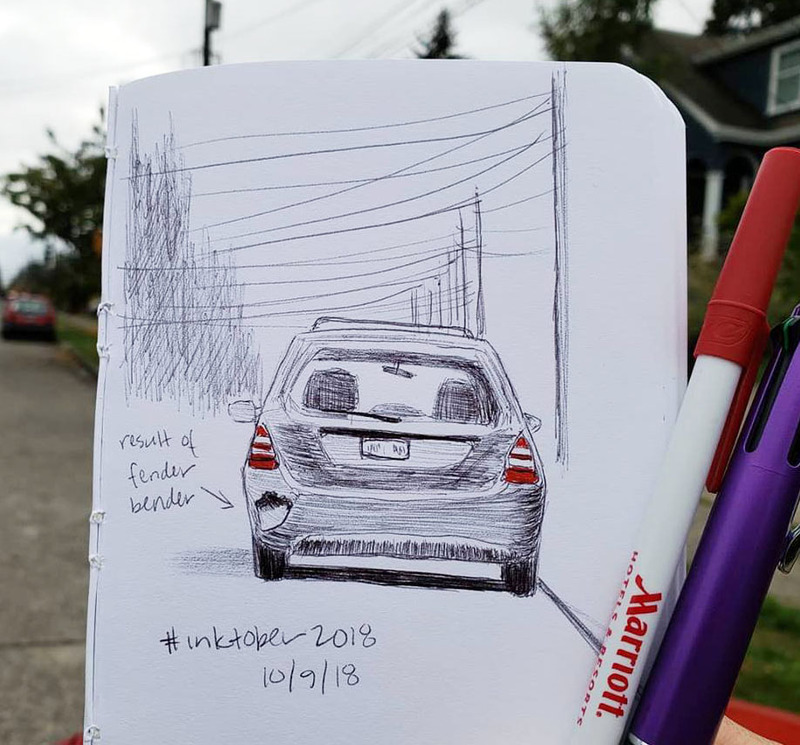 Week 3 of InkTober went better than week 2. Although I still felt the pull of color, I got out often enough to sketch autumn (twice at the Japanese Garden and another time in the neighborhoods) that I didn’t feel deprived working in ballpoint. 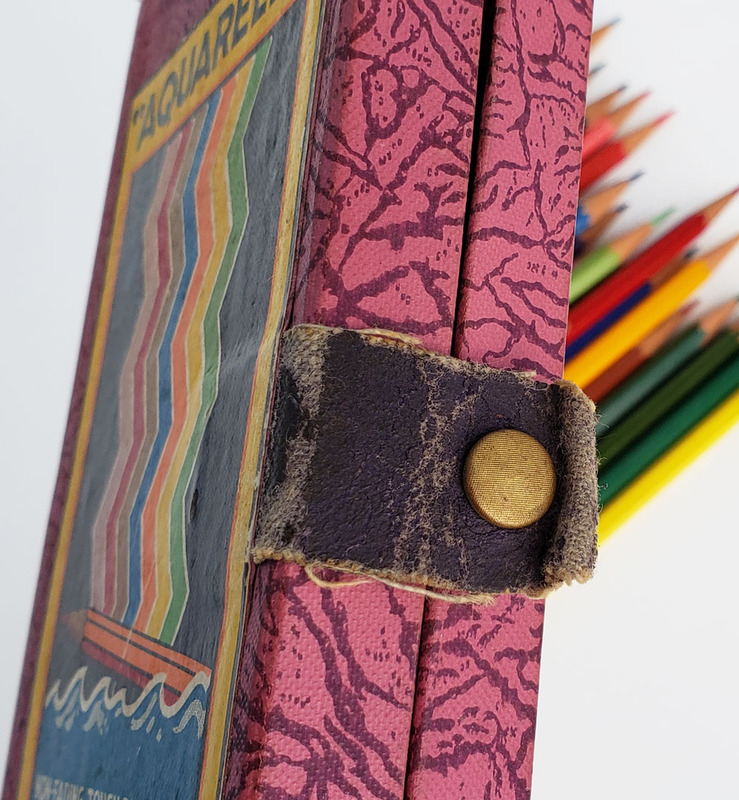 It also helps that I’ve been using a notebook with bright colored paper, which enables me to use it like toned paper (as I use red Sweet Tooth Field Notes). 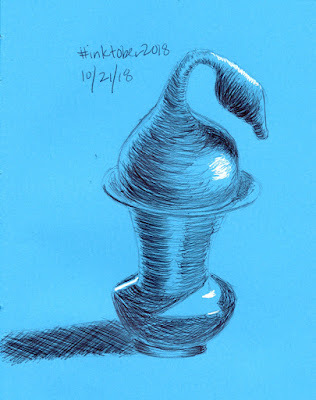 When all the tone work is shown with hatching, it’s difficult to indicate highlights, so being able to use touches of a white Gelly Roll pen gives sketches a nice spark. More important, though, is that I’m feeling friendlier toward my new buddy (not quite BFF), the Bic. 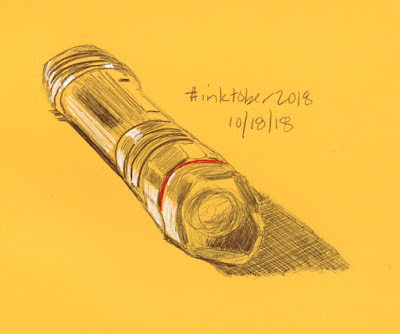 Not the Bic Cristal I paid less than a quarter for; it’s the one I picked up at a hotel – free. Its point is fine enough that it doesn’t have blobbing issues, and if I regulate the pressure the way I would a pencil, I seem to get the best results. Hatching no longer feels like an onerous task. I enjoy the meditative quality of filling in spaces with lines. After the more difficult work of drawing the contour (which I also enjoy, but it takes more concentration and effort), hatching is relaxing and rewarding while still being challenging in a different way. Coincidentally, an Atlantic article that was published in 2015 came to my attention last week. How the Ballpoint Pen Killed Cursive talks about how the invention of the ballpoint in the ‘40s “changed how most people experience ink.” Compared to a fountain pen, the most commonly used type of pen before the ‘50s, ballpoints require more pressure and significantly changed the way most people write. 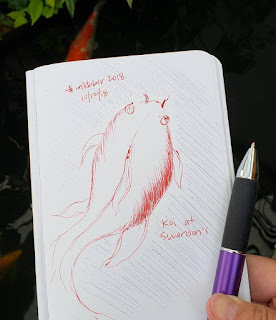 That was one of the first things I noticed when I started drawing with ballpoint: I have to apply more pressure and use a different grip than I do with the fountain pens, brush pens and pencils that I’m more familiar with. Like any tool, it takes a while to get used to. Of course, I still need much practice – 23 days with a new art material is hardly sufficient to learn how to use it – but I do feel more confident now. It helps that I’m choosing mostly simple objects to practice with. Although I had heard of Diwali, the Hindu festival of lights, I didn’t know that Seattle held a festival for it until last year, when I saw Ujjwal Mahajan’s sketches of the event. 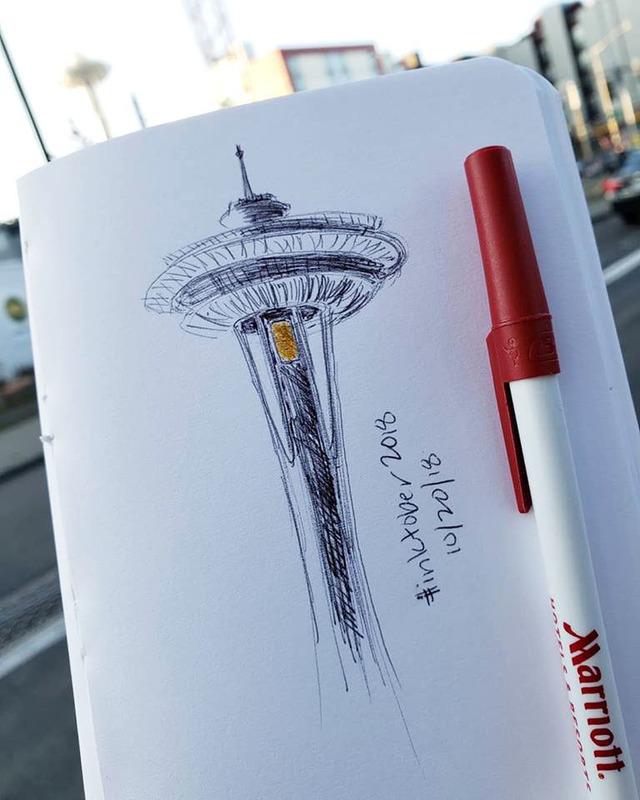 As soon as I did, I put the festival on USk Seattle’s calendar so we wouldn’t miss it this year. 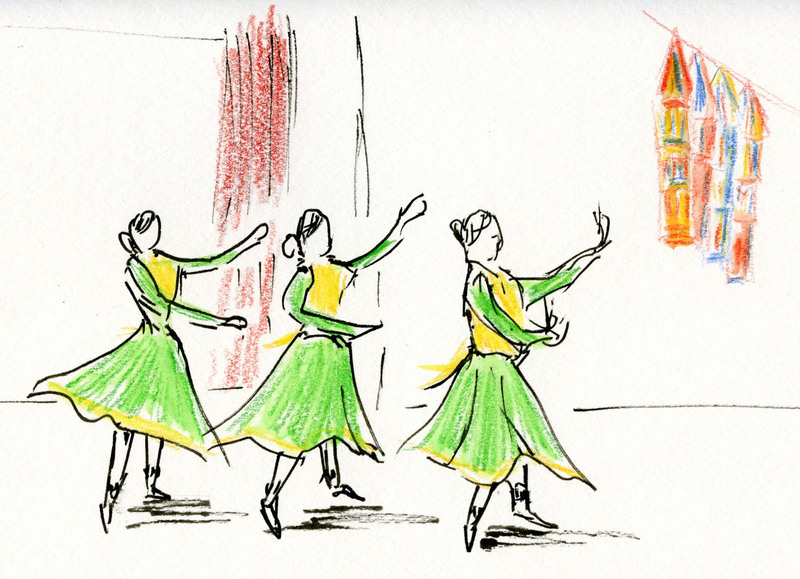 Held at the Seattle Center’s Armory last Saturday, Diwali was full of color, music, dancers, food and everything else I enjoy about festivals. I spent most of my time near the main stage, where small groups of women performed traditional dances wearing vibrant, colorful costumes. 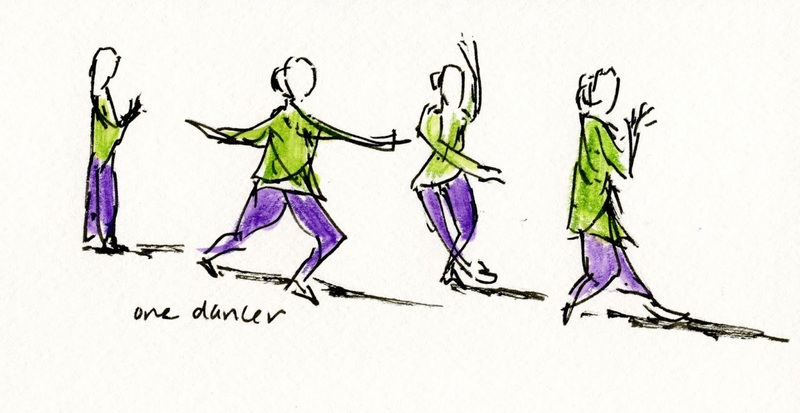 Capturing their fast, flowing movements was a fun challenge. With a few minutes left before the throwdown, I stopped to sketch a young woman applying henna in intricate patterns to the hands and wrists of other women and girls. The henna came out of a small tube like the kind used in cake decorating. 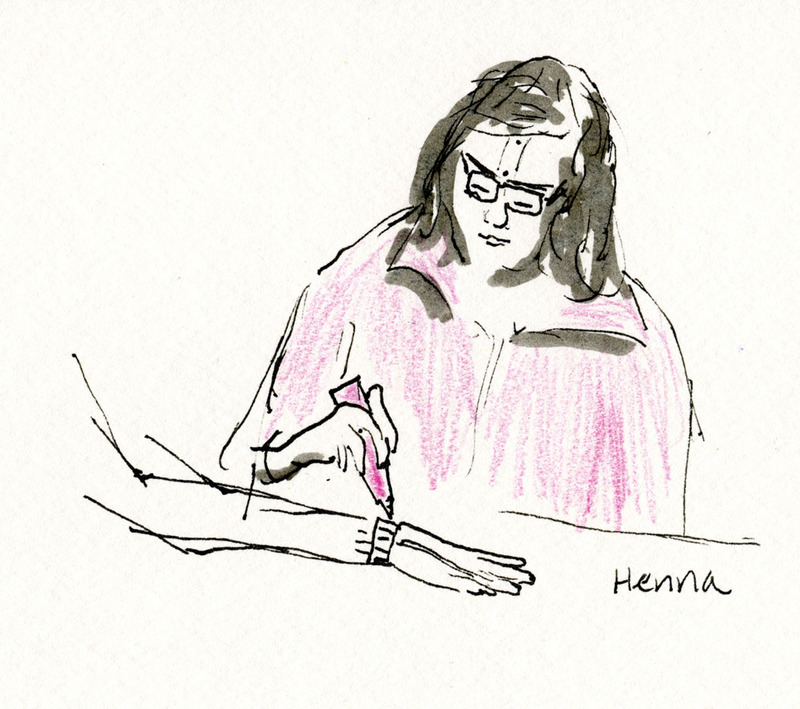 The patterns were so beautiful that I was tempted to have my hand done too, but she had a huge line of people waiting. This festival was so much fun to sketch that I would love to see it become an annual fall event for USk Seattle! 10/20/18 Ellie gives a demo at tiny Lynn Street Mini Park. On a chilly, foggy morning, I went out to what must be Seattle’s tiniest park ever: Lynn Street Mini Park on the east shore of Lake Union. 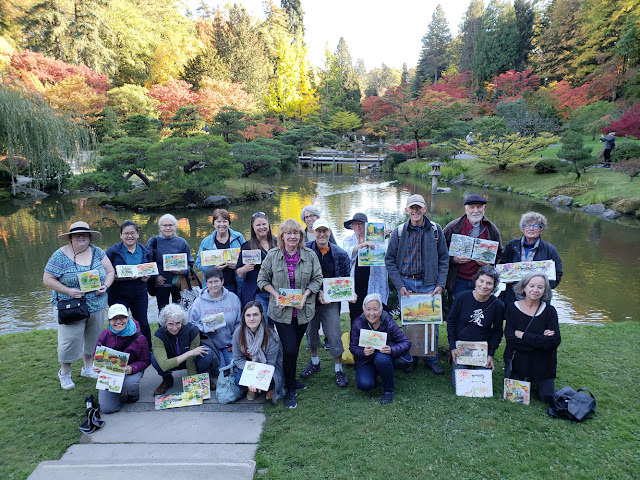 That was the location of Ellie Doughty’s USk 10x10 workshop, From Afar: Rendering Atmospheric Perspective in Watercolor. 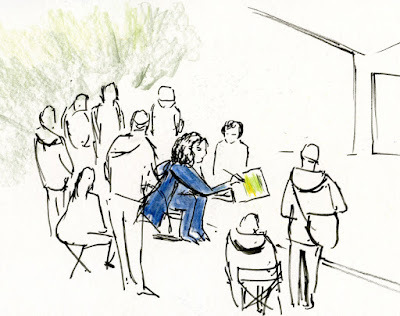 Stopping by for a quick sketch and a few photos, I couldn’t take the workshop myself, but from all reports, it was an inspiring, well-organized experience for her students. 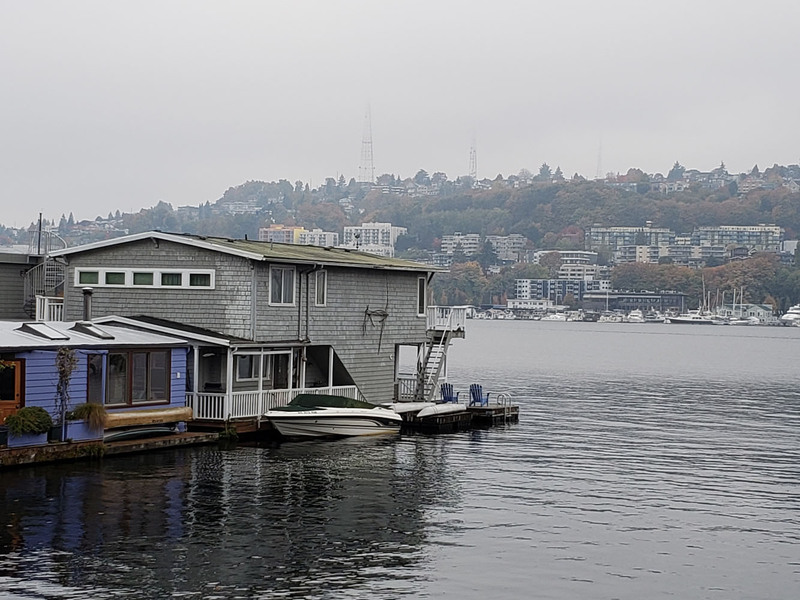 And she couldn’t have picked a better day to focus on atmospheric perspective: Boats and buildings on the near shore were in marked contrast to the foggy landscape on the opposite side of the lake. A great morning for atmospheric perspective. 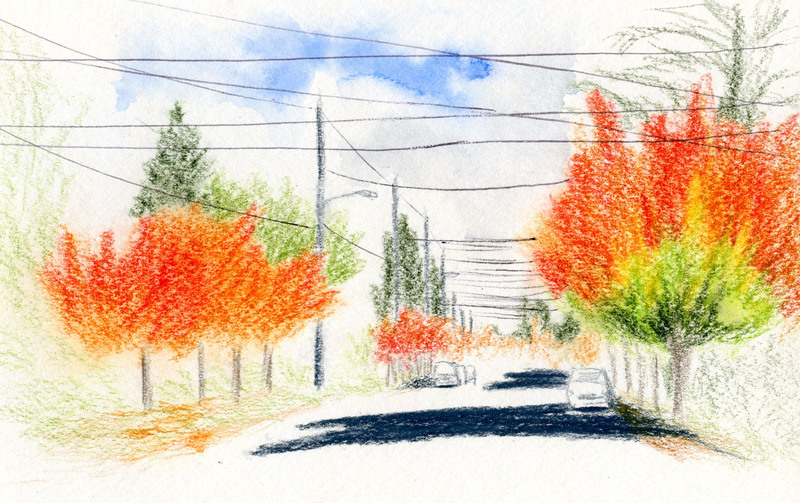 It had been a couple of weeks since I sketched the maples at Metropolitan Market, and they were still at the peak of color when I shopped there last Saturday, so I thought I would have one more opportunity to sketch them before the color was gone. Alas, yesterday afternoon, the brilliant oranges and reds were now more brown, and half the leaves were already on the ground. I was too late. Suddenly feeling panicky, I drove west to the Greenwood neighborhood to see how my favorite maples on Dayton Street were doing. . . could they be near the end already, too? 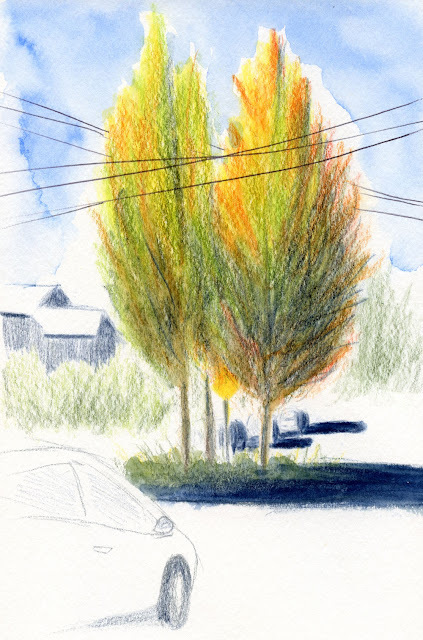 It had been more than a month since I sketched them when the color was just beginning on the northern tree (on the right). Now that one was well past its prime, and the southern tree had lost some leaves, too. Again, I was too late. On the upside, it was warm enough that I could sketch from the sidewalk instead of in my car as I usually do, so I was able to get a slightly different angle on the intersection for a change. 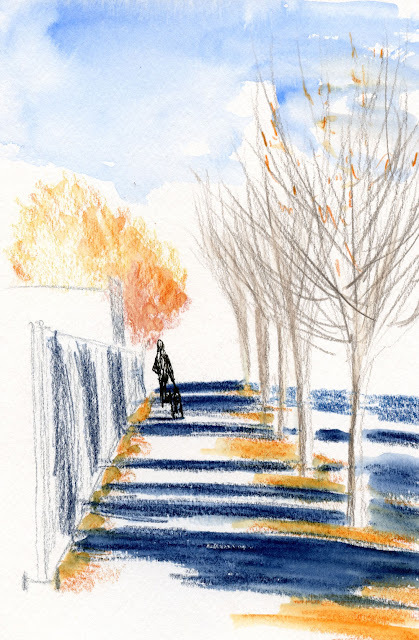 Just the other day I had read Shari Blaukopf’s blog post about the challenge of painting trees when they are half in light, half in shade. 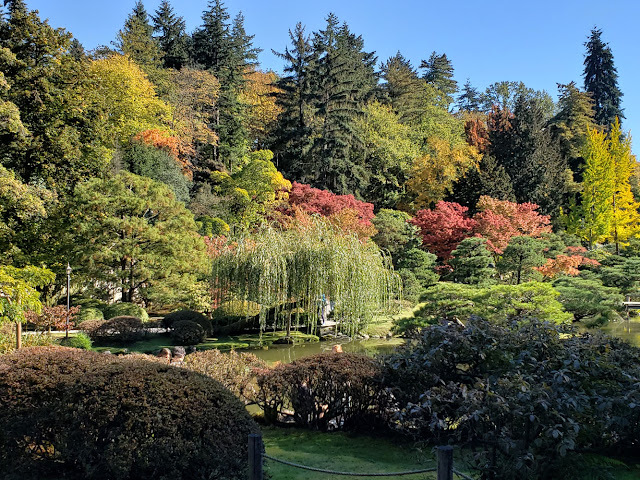 Having her post in mind, as well as all my recent work in value studies (in formal classes and in self-study), I focused my attention this time on trying to convey the light in the tops of the trees and, by contrast, the shade on the lower half. It’s amazing to me how much I don’t see until I suddenly see it – and how many years it takes to finally see it. But unlike these trees that I wanted to catch at their peak of color, it’s never too late to see. Early in my vintage colored pencils series, I reviewed the Eberhard Faber Mongol (which I also mentioned months later when I experienced my most exciting colored pencil geek moment ever!). 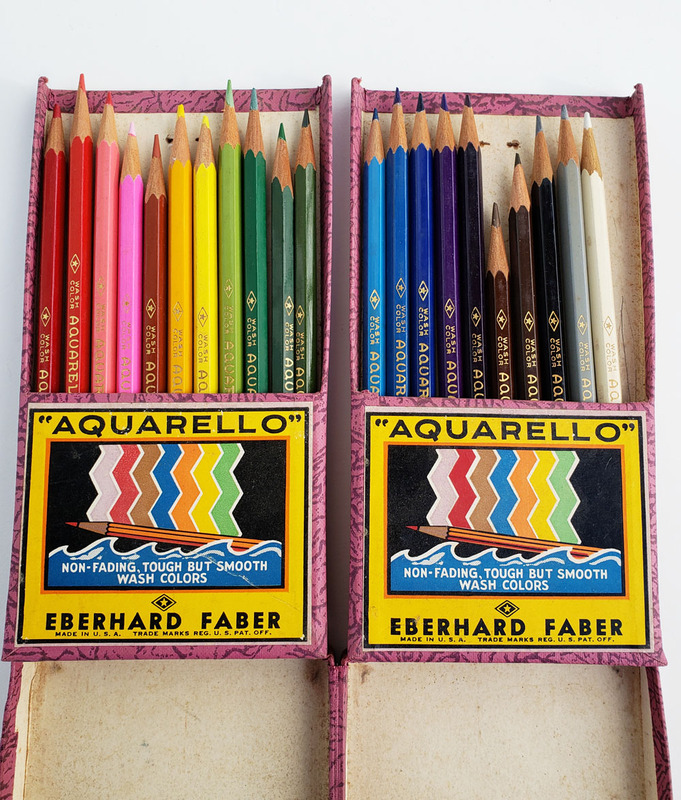 At the time, it was the only water-soluble colored pencil in my fledgling vintage collection. 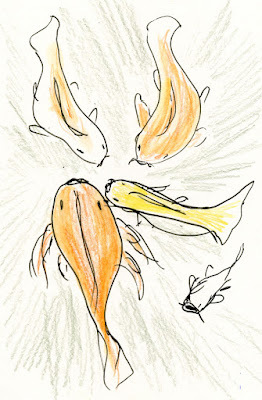 Of course, as a subset of the colored pencil universe, water-soluble pencils are of particular interest to me, since they are my current coloring medium of choice. As is true of contemporary materials, historic pencil manufacturers produced many more traditional colored pencils (wax- or oil-based) than watercolor versions, and the latter are more difficult to find. Although the used set I got on eBay was not complete, the cool original box was in better condition than most I’ve purchased from the era. The hinged trays can be made to stand up on the desktop. I get a kick out of the marketing copy: “The colors can be ‘SUPERIMPOSED.’” I see that the same “Paint with pencils” tagline that appears on Mongol packaging is being used here, too. I love the snap tab closure; a similar tab was used in some production years of the Mongol, too. (My Mongol box doesn’t have one, but I saw it on the one that appeared in The Post.) These similarities in packaging make me wonder if one superseded the other in Eberhard Faber’s collection or if they existed side by side. A snap tab keeps the compact box closed. The Aquarello has a plain, unfinished end. I miss the lovely metal end cap and equally beautiful typeface on the Mongol. I wish I knew the years they were produced relative to each other. Unfortunately, this is a brief and mostly pictorial review, as these washable “colored leads” are just as wimpy as those of the Mongol. 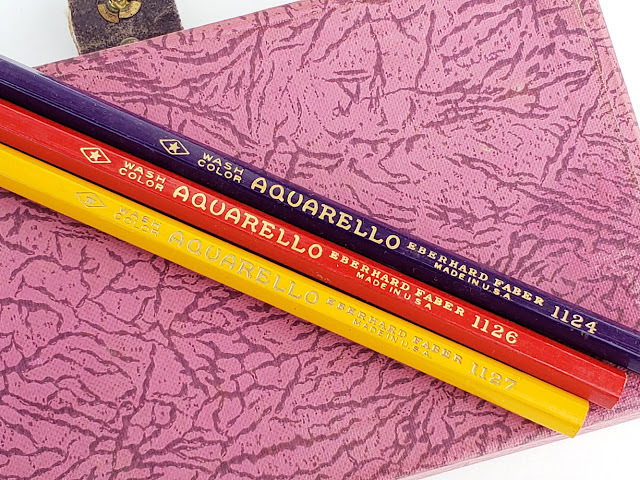 A bit softer and containing slightly more pigment than the Mongol when dry, the Aquarello takes some scrubbing to activate. 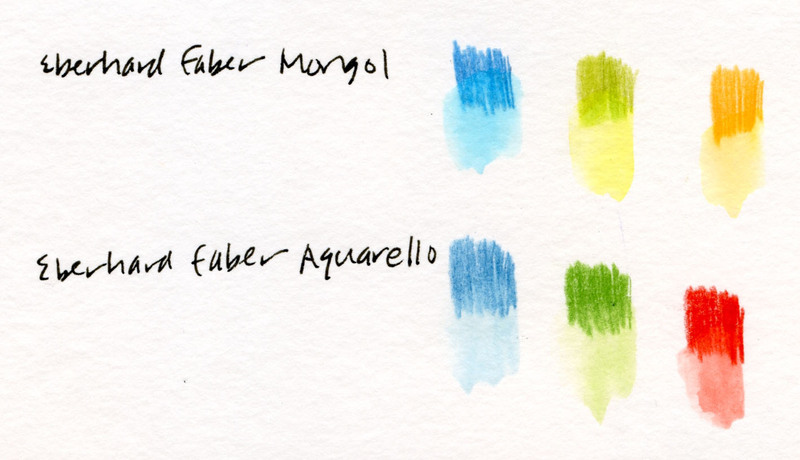 Perhaps the Mongol was intended as a harder pencil for details, while the Aquarello is slightly softer for coloring. The Mongol and Aquarello have similarly pale washes. 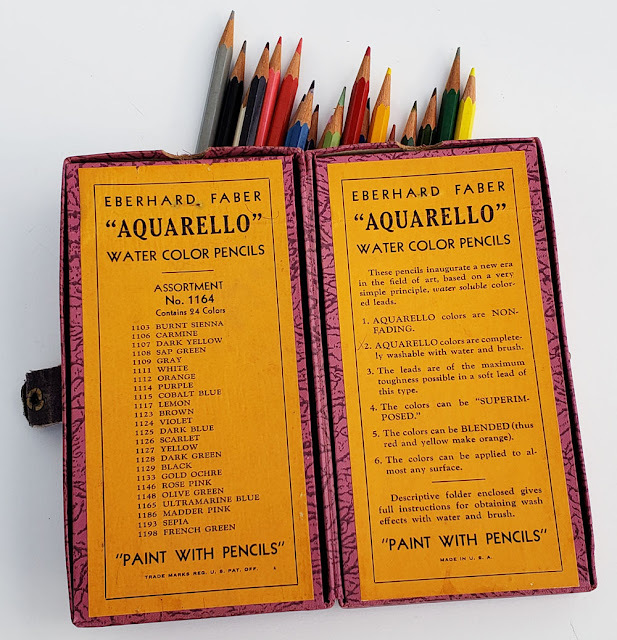 As a colored pencil historian, I appreciate seeing these early American predecessors to my favorite art medium. 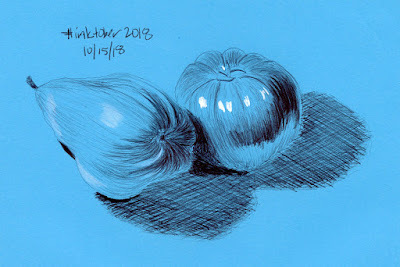 And using them makes me doubly grateful for contemporary water-soluble colored pencils, which are so much softer, contain more pigment and dissolve with greater vibrancy. 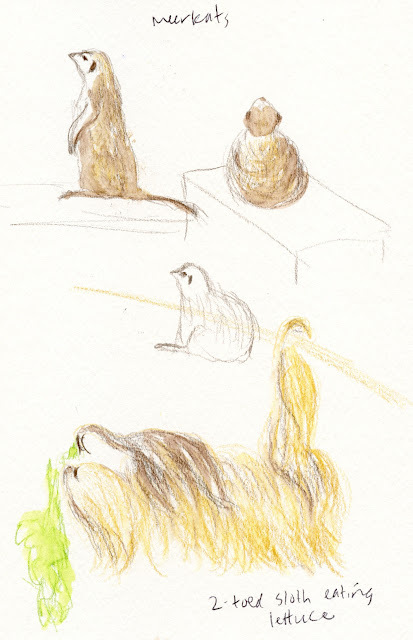 Honestly, even very inexpensive contemporary watercolor pencils seem better than vintage ones. Of course, I don’t buy vintage pencils with the hope that I’ll find one of better quality than what I can buy easily off the shelf today; I collect them for their historical interest. 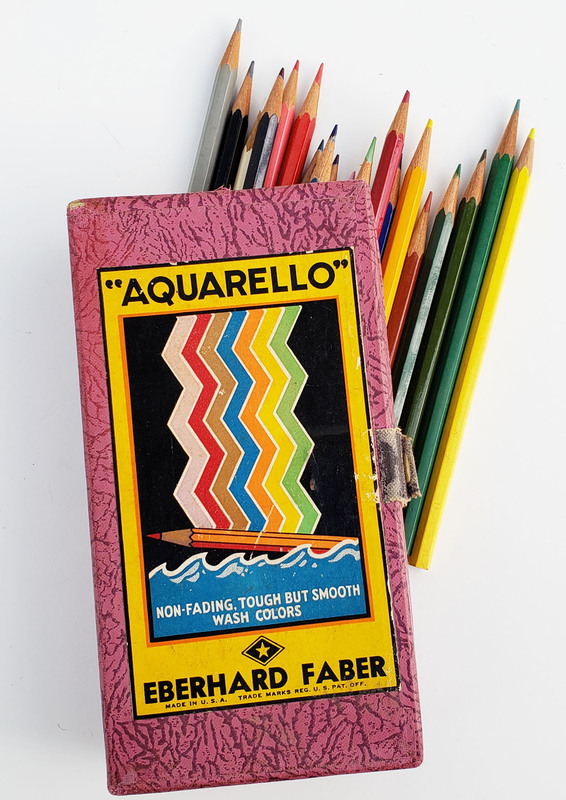 As I concluded when I compared vintage and contemporary Goldfaber sets, it’s good to know that technology and manufacturing processes have improved over time, making it possible to produce better quality pencils, even at the low end of the price range. When Greg saw my sketches and photos of the Japanese Garden the other day, he decided he needed to see it for himself. 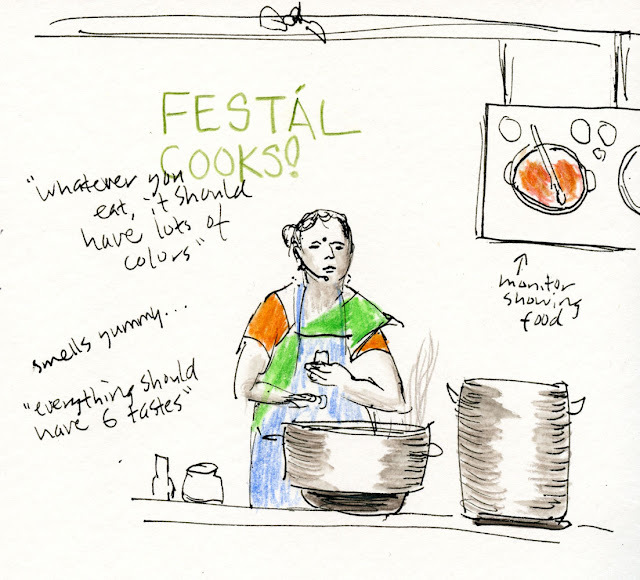 So the next day while he photographed all the color, I tagged along for more sketches. I can’t seem to get enough of our fall! This time I focused on a pair of brilliant yellow trees (I wish I knew what they were. . . 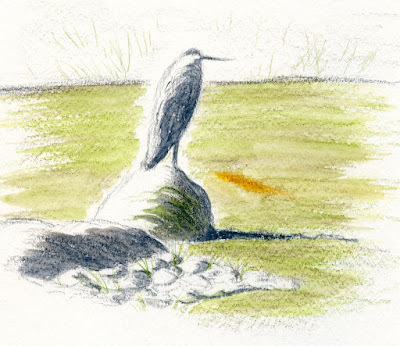 I see them often enough in Seattle) behind the pond. Then I tried to capture the twisty motion of the hungry koi gathering near the pond’s surface, hoping for a snack, whenever someone crossed the bridge. Remember all those days in August when smoke from wildfires ruined what should have been the best of our summer? Those lost days are being returned to us now with yet another week of unbelievably beautiful weather. 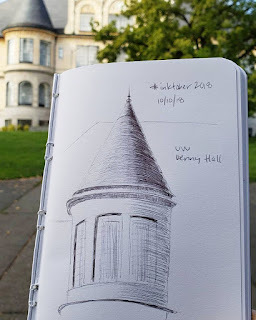 If I’d known then that I’d get those sketching days back in the fall, I never would have complained, because truthfully, I prefer these temperatures in the 60s (even when I have to put on my jacket in the shade). 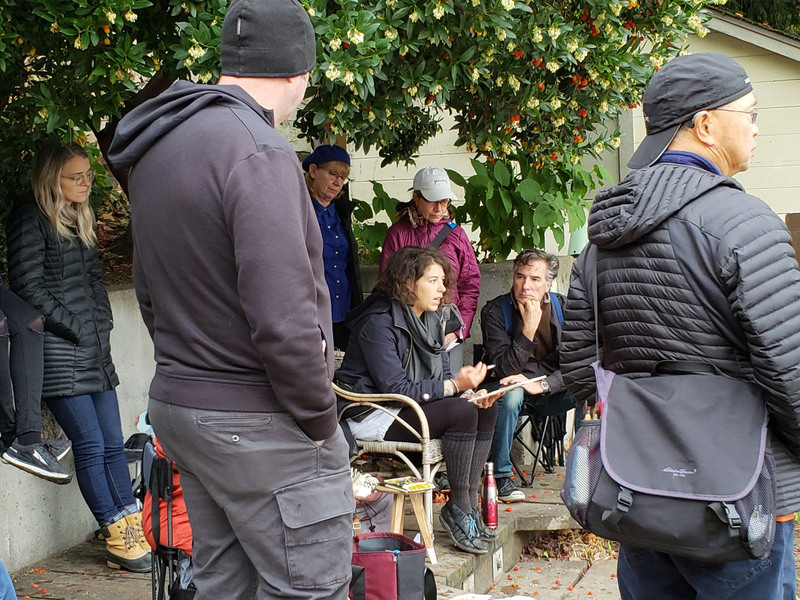 With the weather forecast predicting yesterday’s sunshine, we took a chance last week and scheduled a sketch outing, even though it was still seven days away, when conditions could easily change. I kept my eye on the forecast, and our optimism was rewarded. I think it may have been USk Seattle’s most colorful outing ever! As I entered the garden, I overheard people chatting about a gray heron in the pond, and I assumed it would be gone by the time I got there. To my surprise, he was still taking his time preening atop a rock, so I couldn’t resist grabbing him first while I could. Amazingly, he stayed the whole time I sketched. 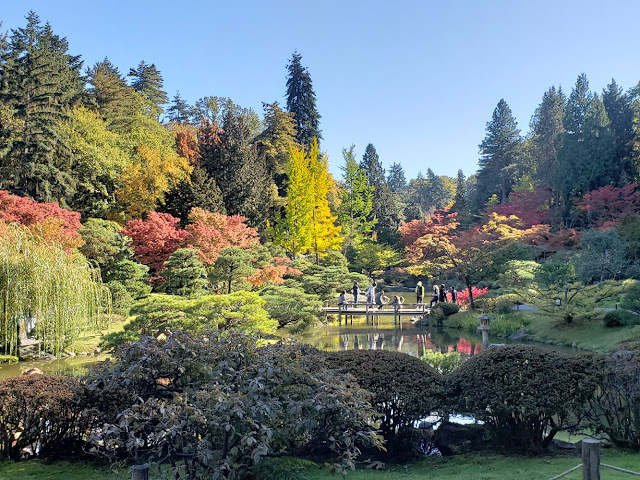 After that I walked around the whole garden to take in all the color lighted by the low afternoon sun. 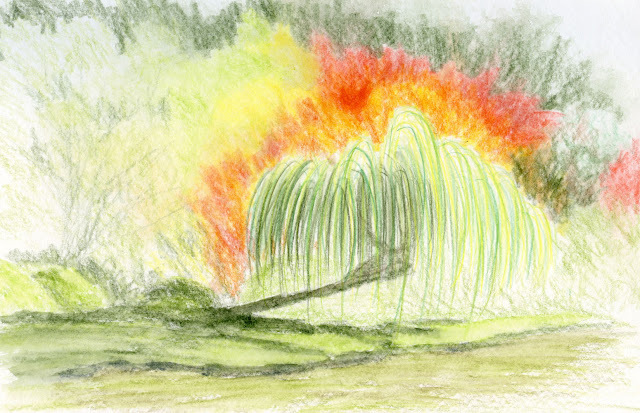 A weeping willow growing nearly horizontally over the pond was challenging but, again, irresistible. Expecting to have only my usual 15 or 20 minutes left before the throwdown, I was surprised to see that I still had a half-hour. Plenty of time for a third sketch! 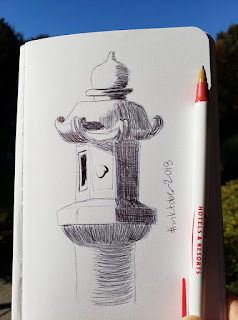 A stone lantern by the path was filled with shadows ideal for hatching. 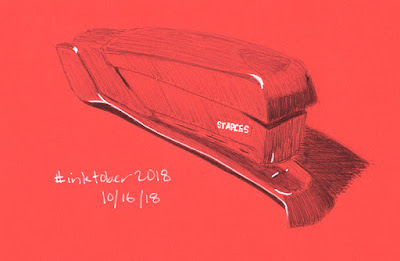 I’d already done an InkTober sketch for the day, but what the heck – I could get a head start on tomorrow. For a short-notice weekday, we had a great turnout! 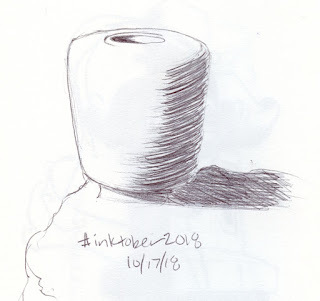 Week 2 of InkTober was less revealing and insightful than week 1. 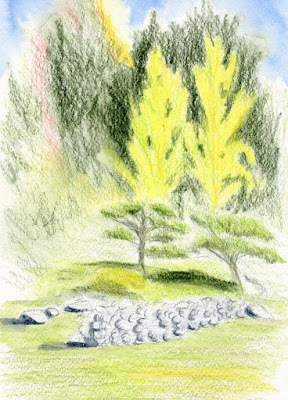 In fact, it was a bit of a struggle because the weather was lovely, and when I’m sketching outdoors, I want to use color. 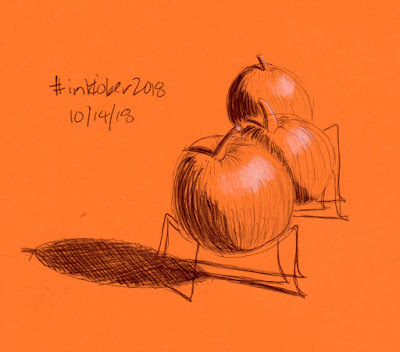 If I didn’t have time for both a full-color sketch and a ballpoint sketch, then I felt “obligated” to use the time for my InkTober sketch. Sometimes I was hasty, just to “get it over with.” It’s a common dilemma, I think, for participants of any challenge like this. And yet, despite that tension, I admit I’m still learning from my insistence on hatching with ballpoint. Some part of me appreciates the self-discipline of simply sticking with something every day, even if I’m not really in the mood. Ballpoint is still so new to me that it’s a challenge from start to finish; I feel no sense of comfort or familiarity as I do with all my favorite sketching media. My process-oriented self enjoys observing this discomfort. Victorian work ethic or masochism? Call it what you will. 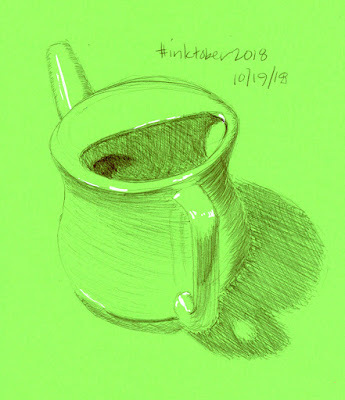 You already saw my kaput Krups coffeemaker; here are the rest of last week’s InkTober sketches. I’m putting all of them into this Flickr album. 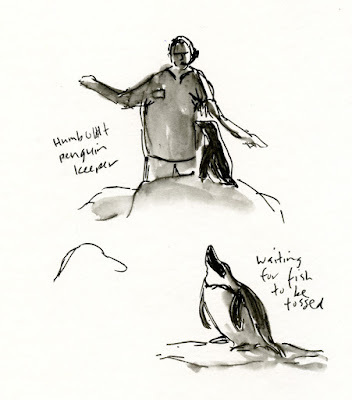 Although we’re Woodland Park Zoo members, it had been ages since we last visited (I was in the zoo’s Rose Garden a few weeks ago with Urban Sketchers, but I didn’t see any animals). On yet another fabulous fall afternoon, we went to see a few of our favorites. Next were my personal favorite, the meerkats. I’ve sketched (or attempted to sketch) them every time I’ve visited the zoo, but they move so fast that they are very challenging. I love their curious poses and quizzical expressions as they rise up on their haunches to look around. A few exhibits over from the meerkats was a two-toed sloth. Hanging upside-down from a rope as he ate lettuce, he looked like a carpet (and moved about as quickly as one). I couldn’t help but recall the scene in Zootopia, in which all the Department of Motor Vehicle employees were sloths! By late-afternoon, I was getting cold, and we had both optimistically underdressed (seeing sunshine and a blue sky will do that). Before dashing home, though, we had to make a quick stop at the new Assam Rhino Reserve, where a couple of young one-horned rhinos, Taj and Glenn (named for astronaut John Glenn, I learned), were feeding. Some obstructions kept me from seeing most of their leathery bodies, but I got a good look at the head of one of them munching hay. 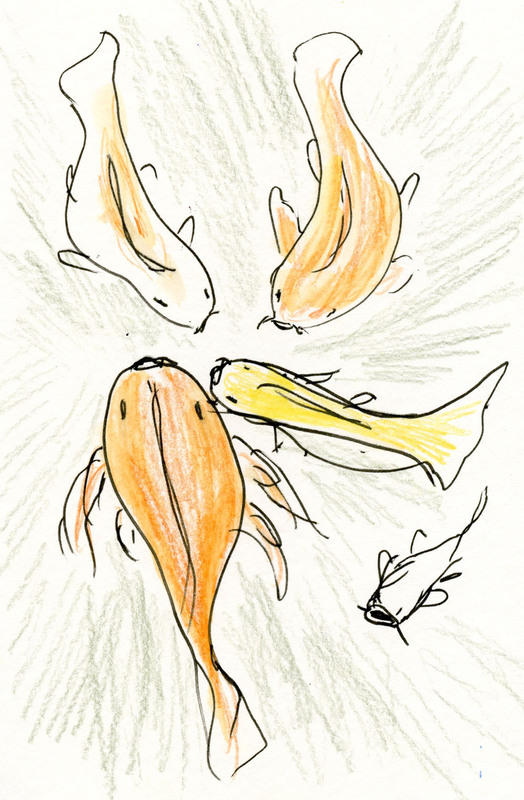 I hope to catch them again sometime when they’re out in their pool so I can sketch more of their substantial girth.